Recently, I've been smitten by Warhammer: Age of Sigmar. I picked up the starter set awhile back because the minis are fantastic and I was intrigued by the new, simplified, fantasy rule set. But what pushed interest into action was the release of the General's Handbook. I had been holding out on diving into this until my paternity leave began. It didn't take long reading the Matched Play section to notice that so much of what plagues current 40k game-play has been directly addressed in Age of Sigmar (AoS). I never really played Fantasy Battle (was always interested but couldn't afford it time and money-wise) so my perspective mostly comes from playing 40k. 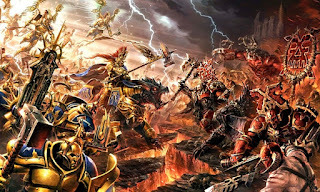 I'd like to do an in-depth write up of what specifically I find promising about AoS but will reserve final judgment until I can get some actual games in. But for now, based on what I've read and the several AoS battle reports I've seen so far, it's definitely motivated me to start putting together the two factions that come in the starter set to begin familiarizing myself with the game. If I do end up going full hog into AoS I can see myself collecting Fyreslayers. I understand this is merely a repacking of a Dispossessed Unforged but it's been a fun model to paint nonetheless. Can't wait to finish him up and possibly start on some more dwarfs! This model didn't glue together as smoothly as I'd like but nothing some green stuff can't fix. Painting this Dracoth has been a lot of fun as I work through which paint scheme I'd like for my small band of Stormcasts. I haven't completely settled on the scheme but thinking I will incorporate Averland Sunset yellow for the insignia. Great times indeed! Hopefully they will help keep me going with these projects and I'll have some regular hobby progress to share for a change. Cheers!